Unsightly yellow teeth are one of the biggest confidence killers when it comes to your smile. Luckily, Zoom! Whitening provides results you’ll have to see to believe, bringing your teeth several shades whiter for a smile that puts the ‘pearl’ in pearly whites. With results this drastic, it’s only natural that the treatment would have a few requirements for aftercare. 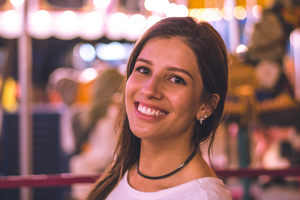 Here’s everything you can expect after your whitening procedure, as well as a few dentist-recommended tips on making the most of your investment. Your teeth are more susceptible to stains for up to 48 hours after treatment, so it’s important to take careful consideration of the foods and beverages you consume the first few days post-whitening. If you absolutely must get your caffeine fix, be sure to use a straw so that the beverages don’t come into contact with your newly whitened teeth. OUR TIP: As an added precautionary step, use over-the-counter whitening products such as mouthwash, toothpaste, and chewing gum after ingesting any foods or liquids that may cause stains. If possible, many dentists recommend maintaining a special “white diet” during this period, meaning you only consume white or clear foods and beverages (such as milk, egg whites, and bananas). But it’s not just what you put in your mouth that runs the risk of dimming your brighter teeth. Even lipstick can make its mark on your smile if you accidentally get some on your teeth. As a rule, if it can stain a white t-shirt, it can also stain your smile. Over time, the results of your Zoom! treatment will start to fade. That doesn’t mean that you need to hop back into the dentist’s chair for another session, though. After your initial procedure, your dentist will supply you with custom-fitted trays and a special Zoom! solution to use as needed. With your at-home whitening kit, you can touch up your pearly whites from the comfort of your home - no need to schedule an extra dentist appointment! OUR TIP: As with most things in life, proper care and maintenance make all the difference in how long your whitening treatment lasts. Utilize the take-home whitening system once every four to six months for a quick touch-up that gives your smile an added color boost. While extreme discomfort after treatment is uncommon, a small number of patients do report experiencing heightened sensitivity from Zoom! Whitening. This pain presents itself as a bothersome tingling sensation, often referred to as ‘zingers,’ on your teeth. To combat this symptom, Zoom! comes with a special anti-sensitivity gel to take home with you. If sensitivity occurs, this solution should be placed in your custom trays and worn for 30 minutes at night until the discomfort subsides. If the gel isn’t enough to ease your symptoms, we recommend taking anti-inflammatory medication as directed. You can also purchase over-the-counter toothpaste that aids in treating sensitivity to use until your teeth return to their normal sensitivity levels. OUR TIP: Teeth whitening is a safe, painless procedure for most. However, excessive treatment and overuse of whitening gel can be highly damaging to the health of your teeth and gums. Whether you choose Zoom! Whitening or another treatment for your smile, be sure to follow your dentist’s maintenance instructions carefully. While it may be a pain to take special care of your teeth for a few days after Zoom! treatment, the results are well worth it. After two days of giving your smile a little extra TLC, you can enjoy a much brighter grill for years to come without worry. Ready to dive into a brighter smile? Contact us today to set up your FREE smile consultation!